Friends wonder why we have a fireplace living in Florida. Maybe it’s the Yankee in me, but I had to have one in my home. Believe it or not it is used several times a winter once the temps drop to 50 over night. Still, that may only be for a month or two. So how does one take a fireplace feature and make it work well during the rest of the year? 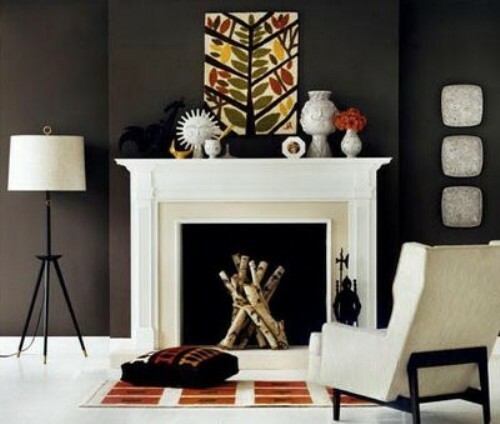 Well, I have a few wonderful ideas that turn an unused fireplace into an amazing feature fit for any home or cottage. A personal favorite is the use of stacked white birch left to adorn the fireplace. They are a crisp and clean look. My logs while hardly clean come from my grandparents home in Maine. They were lovingly gnawed by a beaver and then cut smaller by my grandfather in an effort to clear his driveway. If you are not fortunate to have acquired which birch from a forest near you they can be purchased from a number of online retailers. Of course, purchasing some would also ensure a cleaner appearance too. I love the idea of a collection of candles tucked artistically arranged in a fireplace. There are so many ways to arrange them too, from simple candle sticks to varied heights and widths of candles the options are endless. This look would work well year round in a fireplace that has been bricked in and closed off from the chimney. A very unlikely use of for books wouldn’t you say? And yet I think it’s an amazing way to add texture and interested to an otherwise nondescript fireplace. I especially like how the faded browned pages of the books tie the rug, mirror frame and baskets together. The whole look inspires me to pick up a good book, pour myself a cup of tea and curl up with throw for an afternoon. What would you do with a fireplace during the off season?